The best advice I can offer to a client as a contractor and designer of thousands of outdoor lighting systems is to keep your timing system simple. 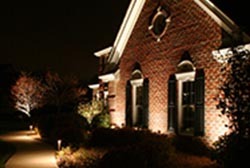 You want all the lighting to come on when it gets dark without having to adjust that time manually and you want the lighting to go off at a pre-determined time…lets say 1:00 a.m.
At World Class Outdoor Lighting, we install an astronomic timer that has these features, with no adjustments ever needed by the client. 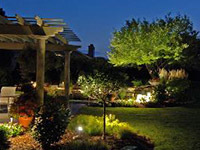 These timers not only allow you hassle-free timing of your outdoor lighting system, they pay you back with energy cost savings as well as longevity in lamp life due to the system going on and off only when it should. How many times have you seen a row of homes and one has a street light on - in the middle of the day? Or in commercial situations, outdoor lights left on during the day? That can really add up in the energy bill! Sync the timing of the lights with the need for the light based on the season - i.e. time-of-day. Especially in Wisconsin - being in the Midwest, we have very long daylight hours in the summer and just the reverse of that in the winter. Your lighting system should respond to those changes in daylight patterns. The beautiful outdoor lighting then becomes more of an essential part of your home aesthetics instead of looking like an after thought. Photo eye sensors used to the preferred technology for outdoor lighting systems - but with new technology, the astronomic timer is the simple, more efficient and more affordable alternative. When considering outdoor lighting enhancements for a front walk, sidewalk or front porch, remember these three key elements.